Charlie competes with his fellow shop assistant. He is fired by the pawnbroker and rehired. He nearly destroys everything in the shop and himself. He helps capture a burglar. He destroys a client's clock while examining it in detail. 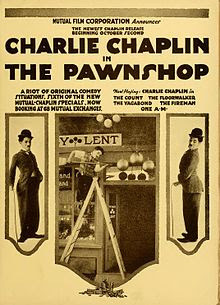 The Pawnshop was Charlie Chaplin's sixth film for Mutual Film Corporation. Released on October 2, 1916, it stars Chaplin in the role of assistant to the pawnshop owner, played by Henry Bergman.